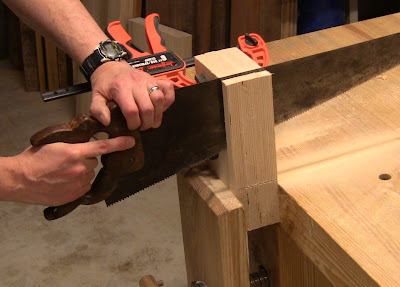 My version of Al Breed's carving vise. This is something I've been itching to make for months, ever since I took a ball-and-claw carving class from Al Breed. 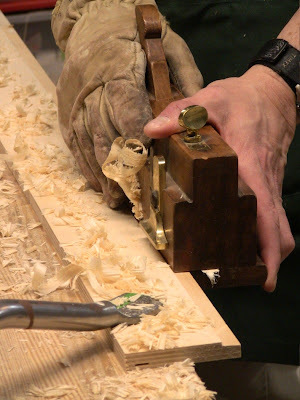 Each student's workbench included one of these carving vises, which he had built based on an iron vise someone had given him. He very kindly gave me permission to do a blog post on them, so I took plenty of pictures. I included my practice carving as a reference piece in the photos, so I could scale general dimensions from it. 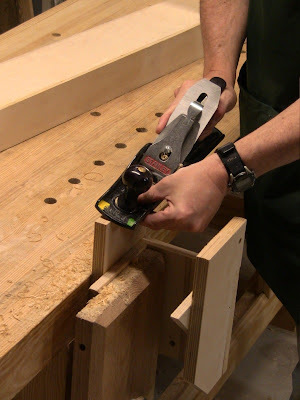 This vise allows you to hold a long spindle for carving between centers and manually rotate it as you work. 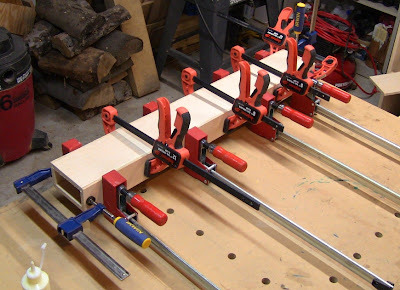 Al just screwed his down to his benchtops as needed, but it can be easily held down with clamps or holdfasts. My version is almost identical to his. The only real difference is that I made the base a little wider. I used 1/2" Baltic birch plywood for the base and triangles, and 3/4" for the uprights and crosspieces. The overall dimensions I used are 3" x 5 1/4" x 36" for the base, and 5" x 10" for the upright sides, with crosspieces and support triangles fitted to size. I actually think I should have made it at least 6" longer (ok, yeah, I should have taken some measurements!). If I ever need to, I can make an extension for the base and attach it with a couple of pieces inside acting as gusset plates. As you can see, the upright with the veneer press screw (the headstock) is fixed to the end. The one with the thumbscrew (the tailstock) slides along the base to be held in fixed positions spaced at 2" intervals via a rod through the base. One consequence of building it a little wider was that I couldn't find a long-enough 3/8" bolt at the hardware store to go all the way through, so I used a length of all-thread with a cap-nut. First sub-assembly was the base. 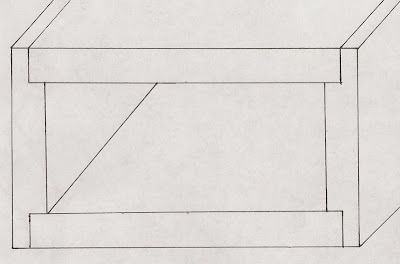 Cross-section diagram of the end of the base, 3" tall by 5 1/4" wide, showing how the sides are rabbeted for the top and bottom. Cutting the base plywood to length from some narrow panels I had. 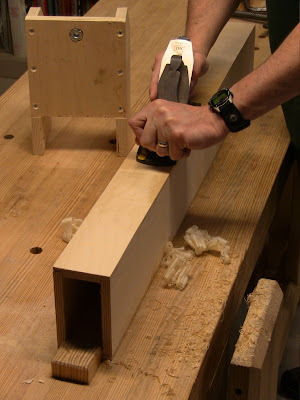 Marking out the width of a base piece. Ripping it down. This stance is a little easier on the back than leaning all the way over with knee down. Jointing the top and bottom base pieces, ganged together. They need to match precisely, since the base is a long rectangular box. 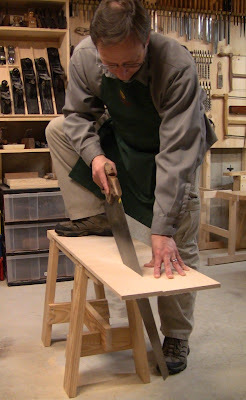 Rabbeting one edge of a base side. All glued up. I should have used cauls to get more even pressure. The hand tools all worked fine with the plywood. The only thing that gave me any trouble was rabbeting one of the side pieces. One inner ply had a knot and some punky grain that caught and tore out. However, since I was going deeper than that ply, it didn't cause any permanent problems. Next sub-assembly was the uprights. 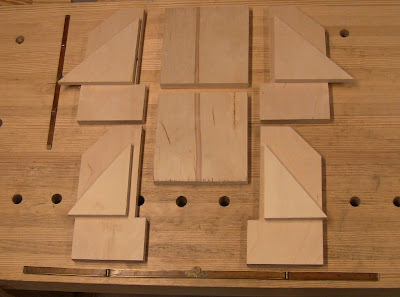 I cut them out as above, then ganged them all up to notch them for the crosspieces. 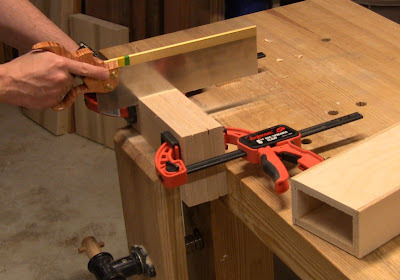 Gang-cutting the base of the notch. You can see how the end of the base came out as well. Down the length of the notch. 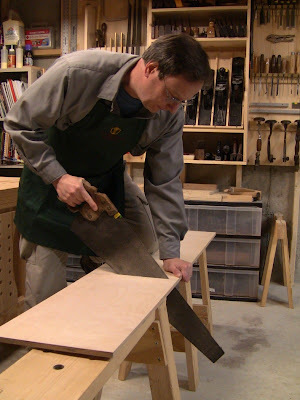 Cutting one pair of support triangles out of a rectangle. I scored down the line with the chisel to get the cut started. All the parts of the uprights ready for assembly. Those are 12" and 24" folding rules for scale. I drilled the holes in the crosspieces for the veneer press screw nut and a tee nut for the thumbscrew. 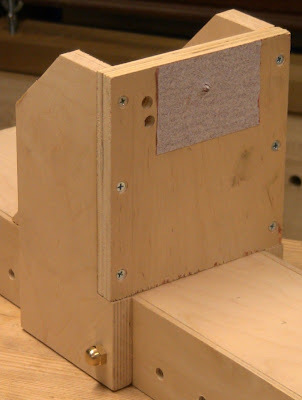 However, for more precise alignment of the holes, it would have been better to wait until everything was assembled before drilling the tee nut hole. Push the tailstock up against the headstock, and crank the press screw up to it to mark the hole position, then drill it. 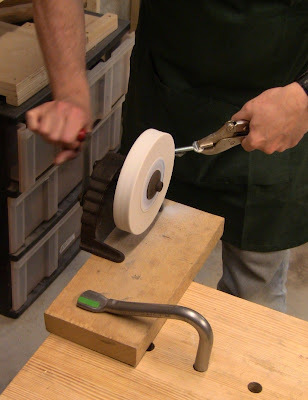 If necessary, alignment can be fine-tuned by fidgeting with the press screw nut in its hole. Then I clamped things up dry to the base for a test assembly. The first thing I noticed was that I couldn't run the press screw in all the way, because the handle bumped the headstock sides. Aha, that's why Al had sawn curves into the headstock! 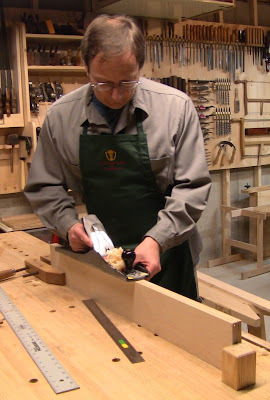 Cutting a curved profile into the ganged headstock sides to provide clearance for the handle of the veneer press screw. 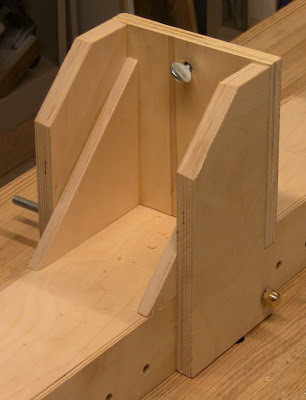 This is the bow saw I built with the Gramercy Tools hardware kit. Sharpening the thumbscrew to a point. It serves as the center in the tailstock. After assembling the uprights with glue and screws, I noticed a couple of things that needed tuning. First, the width of the base was not quite uniform down its length. There were a couple spots where the tailstock would bind and not slide. Second, when the uprights were in place, they actually extended past the bottom of the base by a hair. This meant they would either hold the base up off the benchtop, or the support triangles would not rest flush on the base. With the base on its side, smoothing the high spots with a #4. 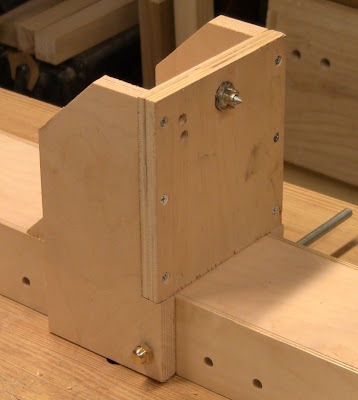 The result was smooth travel of the tailstock along the length of the base. 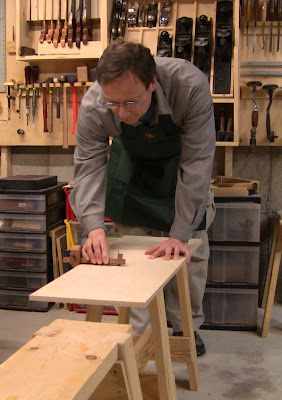 Shaving the bottom of an upright to provide some clearance. From each end of the piece working toward the center, I chamfered the sides, then did the center. This avoided tearout of the plies. Once everything was tuned up, I completed the assembly, securing the headstock and drilling placement holes for the tailstock. 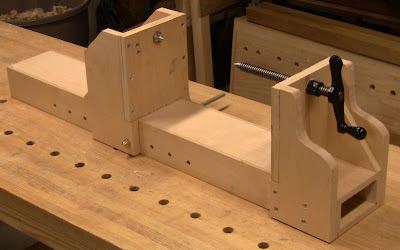 Before assembly, I had ganged the two sides of the tailstock and drilled the hole for the rod. Here I'm setting the tailstock at each position and using those holes as the guides to drill the sides of the base. This detail shows the clearances I want. 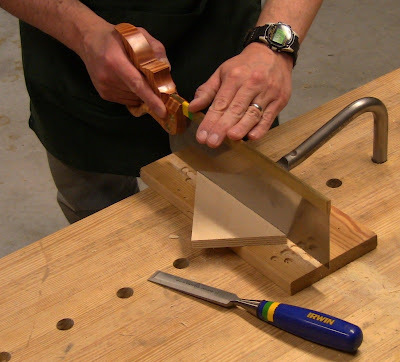 The bottom edge of the triangle rests flat on the base to provide support, and the bottom edge of the tailstock is clear of the bench surface, so that the base rests flat. Detail of the face of the tailstock before lining it with adhesive-backed sandpaper. What are those mysterious holes to the left of the thumbscrew? Detail of the headstock. I also ground the tip of the press screw to a sharper point. Again, those mysterious holes. Here you can see the fit of the headstock to the base. 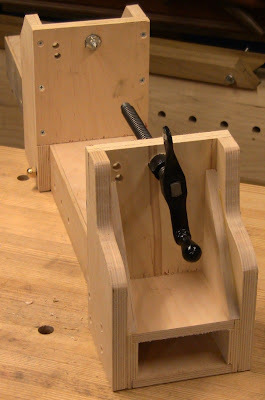 The finished clamp secured to the bench with holdfasts, holding one of my ball-and-claw practice carvings. But see the paragraph and photo below, the left end of the carving needs to be butted up tight against sandpaper lining the face of the tailstock. One detail I forgot to show above, Al lines the face of the tailstock with a half-circle of 60-grit adhesive-backed sanding disc, and backs off the thumbscrew to just barely poke through to the carving. When you tighten the press screw, the sandpaper grips the end of the carving to keep it from rotating while you work on it. When you loosen the press screw so you can turn the carving, the tip of the thumbscrew keeps it from dropping down. Note that this also means the tee nut for the thumbscrew needs to be flush with the face under the sandpaper, so you need to carve out a small recess for it with a gouge and epoxy it in place. Sandpaper lining the tailstock face to grip the end of the workpiece and keep it from rotating while carving. I didn't have a 60-grit disc, so this is a rectangle of 80-grit adhesive-backed paper. So what's this business about a bow lathe? Someone had posted a link on Sawmill Creek Neanderthal Haven forum to this awesome video of a street vendor in Marrakech. He uses a bow lathe to make chess sets, guiding his chisel with his foot. 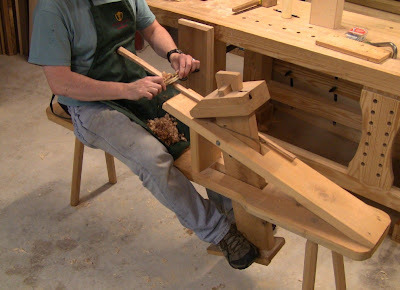 The general consensus was that he embodied the true meaning of craftmanship, because using the simplest of tools, he was able to produce wonderful turnings with great skill. 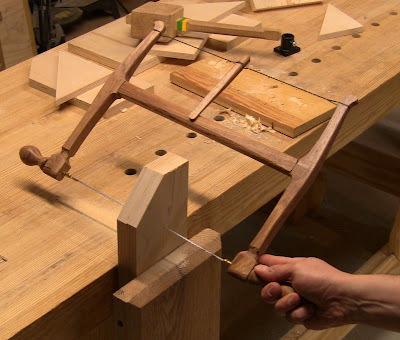 I was fascinated by this, and I realized Al's vise, with it's two spindle centers, ought to make a fine bow lathe. That's why I made the base just a bit wider, for more lateral support. And now we see what those mysterious holes are for. I can run a length of steel rod through them, and that serves as a fixed tool rest for the lathe chisel. The upper hole is actually a mistake; it's on center with the spindle centers, but that means the upper edge of the tool rest is above the axis of rotation, so I added the lower hole for better position. Shaving down the bow with a spokeshave. It's from an oak log I had rived down to small spindles a few years ago, so it has good strong continuous grain down its entire length. Bow lathe mode. You can just see the steel rod tool rest. 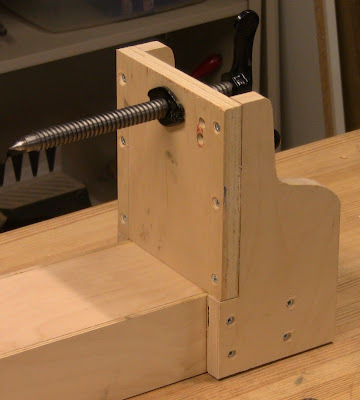 The clamp on the press screw handle keeps it from turning. There's also an extra nut cranked down against the tee nut on the thumbscrew to keep it from turning. I'm not going to show you my practice turnings. They look like they were gnawed on by rats. My skill with a lathe is poor enough to begin with; take away one arm to power the bow, and it's clear this will take some practice to learn! I'm also not too happy with the tool rest solution. There are some other nice bow lathe videos that show up YouTube along with the one from Marrakech, so I'll have to study these all a bit more closely to develop the technique. Otherwise, functionally this all worked fine. 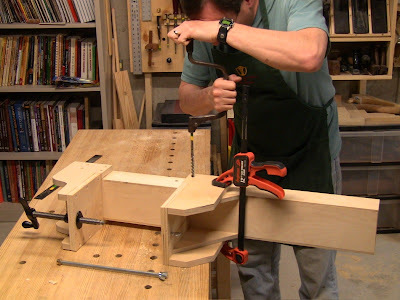 The vise stayed solidly in place on the bench under the forces of the lathe action. 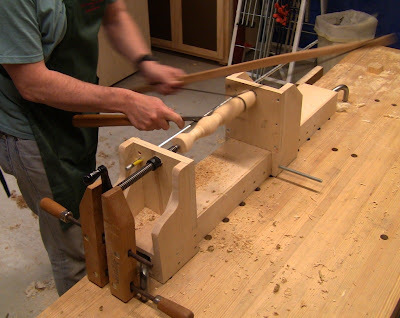 I do see that I need to build a spring pole lathe. Roy Underhill has just the one. But that's for another day! Thank you for sharing your efforts. That is a very clever bow lathe you have put together! This post has been one of the most enjoyable I´ve read, It is a treasure of pics and info, thanks a lot for sharing. May I ask how to make a simple lathe beside this model not intended ? Thanks, guys! Julio, the lathe I want to build is a spring-pole lathe in Roy Underhill's book "The Woodwright's Guide: Working Wood with Wedge and Edge" (in the appendix, Plan E). It's reasonably portable and simple construction. It uses a 1" diameter dowel as the spring-pole, as opposed to traditional spring-pole lathes which typically use a long sapling.